Thank you for sharing the pattern for making these beautiful mitts. The pattern is wonderful. My daughter tells me mitts are something that new mom's don't seem to get enough of. 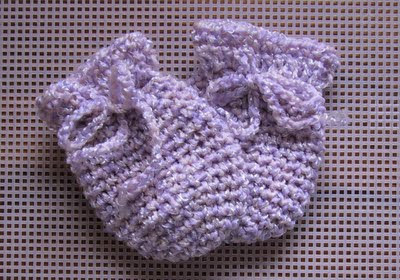 So, as we await the birth of my first granddaughter, my hands are busy crocheting these adorable mitts. Thanks again! Thank you for the pattern. They are very cute & real easy to make. I usually have a hard time reading patterns, but I was able to read this one with ease. Thanks again! These are adorable,practical for newborns, and very simple to understand instructions. Thank you very much for taking the time to share your design. So practical, easy, and adorable. Thank you for sharing. I ADORE these!!! I made several pair 3 years ago when my daughter was expecting her son in 2010. I'm now making them for her daughter which is due in late May/early June 2013. Thank you so much for sharing this pattern!!! Linda L. Campbell, Morrow, Georgia, USA. Thank you for sharing such a great pattern! Just finished crocheting them for a sweet baby girl due in December! I did them in pale Pink, Peaches and Creme. I can't wait to give them as a gift at her baby shower in October. Thanks again! There are lots of them at ravelry.com .